Patsy Cline, a shooting star on the country music scene in the late 1950s and early 1960s, was the first woman to be inducted into the Country Music Hall of Fame. Even if you aren’t a country music fan, you likely have at least a passing familiarity with some of her hits, such as “Crazy,” “I Fall to Pieces,” and “Walkin’ After Midnight” (notably, one of the first songs to crossover within the Country and Pop music charts). Free Range Humans‘ latest offering, Always…Patsy Cline, created by Ted Swindley and Directed by Elizabeth Lucas, with Music Direction by Marci Shegogue, is based on the true, but debated, story of Cline’s unlikely friendship with Louise Seger, a fan from Houston. The pair met in 1961 at a Texas honky-tonk where Cline was performing, became fast friends literally overnight, and maintained a correspondence until Patsy Cline’s death in 1963. A jukebox musical, Always…Patsy Cline includes 27 songs, combining Patsy’s unmistakable contralto with Louise’s somewhat wacky storytelling to send a love letter through time, both to and from Patsy Cline. I may not recall the first time I heard Patsy Cline’s voice as vividly as Louise did, but her music is at the heart of some of my favorite memories of my dad. So I packed my nostalgia and love for all things Patsy, along with my absolute awe at Free Range Human’s inaugural production (a near-flawless Murder Ballad), in the car and made the trek from Baltimore to Frederick. My expectations were high and I was excited to check out the show at Sky Stage, an interesting outdoor theatre space. Unfortunately, my expectations took a hit immediately upon my arrival as I got out of the car and peered into the empty Sky Stage. Alas, Mother Nature had other plans and heavy rain throughout the afternoon had rendered the venue unfit for the performance. A sign board out front confirmed that the performance had been moved to McClintock Distilling, so I headed down the road and pointed the way for a couple of wandering patrons (note to whomever made the signage: a right arrow would be a helpful addition to clarify “just over the bridge”). I arrived at McClintock Distilling with just under 20 minutes to show time and things were a bit turbulent, to say the least. It was very clear that this production does not have a Producer on the team whose focus is the big-picture anticipation of Plans B-Z (Director Elizabeth Lucas pulls double-duty as Producer – this happens a lot in small theatre and this is the perfect example of why it shouldn’t). I have to applaud the perseverance of the production team with the last-minute move, getting the show underway with only about a 15-minute delay. From a production-value perspective, I have to say the show was somewhat less than I expected from the same team that put together the stellar production of Murder Ballad in June. While some of the issues certainly stem from the venue change, some seem inherent to the production. The staging of the show at the distillery faced challenges, as the actors and audience were on the same level, which I know is not the case at Sky Stage. They did their best to mitigate the problem with a simple set including a small platform, high pub tables, and bar stools. I enjoyed the use of period-appropriate pieces that served as both props and set dressing. Louise’s “kitchen table” was set with a radio, kettle, and coffee mugs that may well have come straight out of my grandmother’s house and Patsy’s dressing area was set simply with an appropriate stand mirror. My only qualm with the props was the metal water bottles used by both actors throughout the production where a simple carafe and water glass would have been more appropriate (if breakage was a concern, clear plastic would still have the right look). It may seem trivial, but it took me right out of the story every time. Costume design by Heather C. Jackson was effective overall and she did a great job of capturing Patsy Cline’s look, especially the Western outfits that Cline’s mother made for her early appearances. I’d have liked to have seen a better-fitted costume on Louise, particularly given the several mentions in the script of her clothes fitting like a glove, but her denim-on-denim look was appropriate. I commend Lighting Designer/Technical Director TJ Lukacsina for rigging up a couple of lighting instruments in the distillery to augment the existing lighting when others might have made do with just the ambient light in the time they had to set up. I know Lukacsina and his work well and I would have liked to have seen his actual design for the show at Sky Stage. While I can’t say that his work at the distillery was a lighting design, per se, I appreciate his effort to elevate the production as best he could given the constraints of time and space. Sound design by Logan Waters was plagued with issues of balance between the actors and musicians. According to Waters’ bio, his background is in design for a concert setting. I am hopeful that Waters will continue to learn and grow as a theatre technician, but, for this production, I missed almost every bit of underscored dialogue, as well as much of the vocals sung in a lower register (hugely problematic in a show about a famous contralto). Music Director Marci Shegogue has assembled an excellent music team for the production and Walter “Bobby” McCoy did a great job subbing in as conductor and keys the night I attended. McCoy and the rest of the band – Jimi Cupino (Guitar), Buddy Griffin (Pedal Steel), Justin Thomas (Drums), Andrew Nixon (Fiddle), and Ben Rikhoff (Bass) – were largely enjoyable throughout. 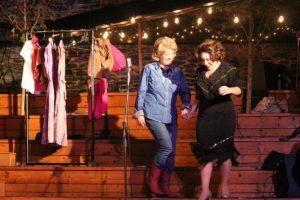 Always…Patsy Cline is a 2-woman show and is distinctly challenging in that both of the “characters” were real people – one of whom had one of the most recognizable voices in music history. It takes time for an actor to find a character and even more time to embody a real, recognizable person. It takes time to build relationships between actors and enable them to portray an immediate connection and enduring friendship on stage. It takes time to know a story well enough to break the fourth wall and tell it directly to an audience as if it’s your own. The Free Range Human’s model of an almost impossibly short rehearsal period may have worked against them this time around. As Louise Seger, Christine Mosere becomes the narrator of the story when she should be the storyteller – a subtle distinction, but an important one. 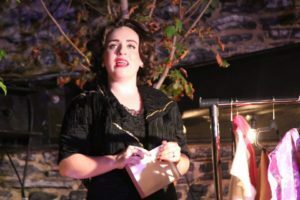 Nearly the entire plot, as it were, of the play consists of Mosere telling the audience perhaps the biggest story of Louise’s life: the night she met and befriended Patsy Cline. This is a story that Louise probably told to anyone who would listen until the words came as easily as breathing. While Mosere is funny and larger than life as Louise, much of her storytelling feels awkward and forced and she doesn’t seem quite settled into the material. Honestly, it’s a bit difficult to critique because, if she had been doing a one-woman show or a standup routine, I probably would have loved her. But in the context of this show, her performance made it difficult for me to believe the story and, therefore, believe the connection between the two women. Shelly Lynn Walsh was vocally on point as Patsy Cline. Despite false starts on a couple of numbers, Walsh captured Cline’s unique voice and style to a tee and powered through a remarkable 27 songs. I appreciate that she embodied Cline’s vocal stylings without coming off as an impersonator – although I equally appreciate the attention to detail on the more well-known songs, especially Crazy. For all the crowd-pleasing numbers in the show, I have to say that my absolute favorite was If I Could See the World (Through the Eyes of a Child), offered as a prayer from a homesick Cline. I don’t tend to like when jukebox musicals shoehorn songs into the plot, but I actually preferred Walsh’s performance during those moments over the numbers where Patsy was performing on stage, television, or radio, as Walsh seemed more invested in those scenes. For as fantastic as Walsh’s musical performance was, the storytelling was lacking for her, as well, particularly in relation to Mosere’s Louise. I simply did not believe the connection and friendship between the two, which is the heart of the entire show. 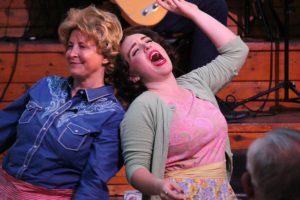 Taken individually, the performances in Free Range Human’s production of Always…Patsy Cline are each enjoyable in their own right. Christine Mosere is sassy and funny as Louise Seger. 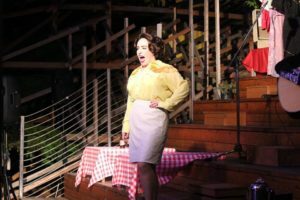 Shelly Lynn Walsh is a musical knockout as Patsy Cline. This is, overall, a decent production – it’s just not a complete one and it’s not the level I expected from this team. I am hopeful that the actors will settle in and find a connection as the run continues, and that the production team will work out the few snags they had. Free Range Humans is definitely a company to keep your eye on and I truly can’t wait to see what they do next. Always… Patsy Cline (a Free Range Humans production) will play through September 2 at Sky Stage, 59 S. Carrol Street, Frederick, MD. Tickets may be purchased at the door or online. Additional performances will be held September 13-16 at the BlackRock Center for the Arts, 12901 Town Commons Drive, Germantown, MD. tickets may be purchased at the door or online.